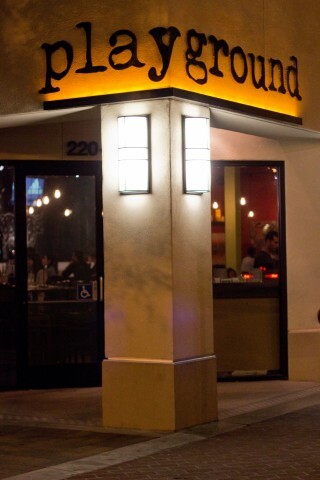 The Playground, a small gastropub in Santa Ana is in it with the rest of them. It seems like Santa Ana’s Art District is attracting a lot of new chefs and restaurants, but The Playground is a bit different. Jason Quinn, the head chef and owner started with The Lime Truck. Winning in The Great Food Truck Race in Spring of 2011, the chef and his team had great foundation of good food and the business. To me, The Playground is exactly what it sounds like. It is a playground for Jason and his team, as well as other aspiring chefs to come and “play” in the kitchen. 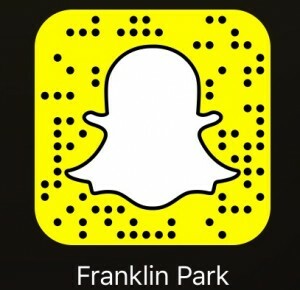 With their new and inventive menu and as well as 2.0, The Playground is one of the most unique restaurants in Orange County. It was a pleasure having a late night dinner here. The menu items were interesting and delicious — something a late night eater is always looking for. It was an adventure. 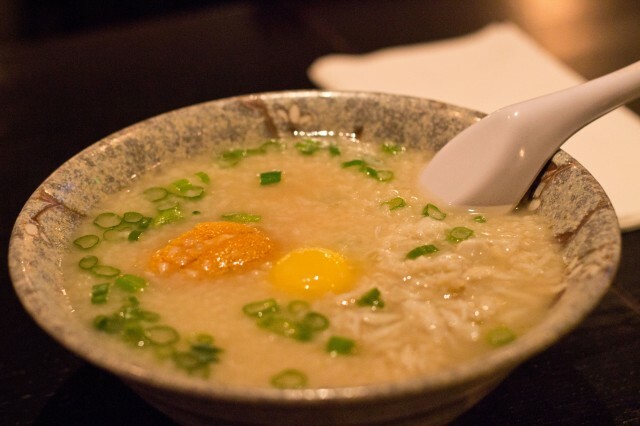 We started off with the sea urchin & lump crab rice porridge. This to me was such a comforting dish. The warm soup broth with the lump crab meat was fulfilling and hearty. The sea salty broth with a seafood essence from the crab made this worthwhile. Although the uni was lacking, the warm uni was creamy and delicious. I would never have thought I would come here to have a lump crab uni rice porridge, but I did. 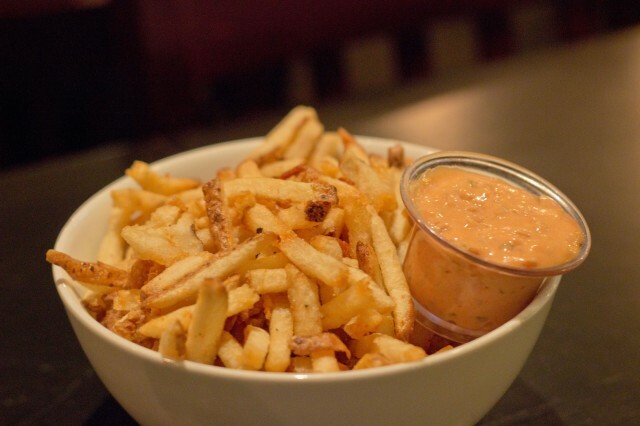 For 5 bucks, you can get a huge bowl of fries. These fries were addicting, and oh so familiar. Hand cut, just like In-n-Out, with a side of secret sauce just like In-n-Out. This ode to the west coast favorite was classically and tastefully done. I mean, the fries tasted on point from taste and texture. It was just like In-n-Out’s but cleaner. Their secret sauce was a perfect match — better if anything. These were fun to munch on, especially with their burger as the main attraction. 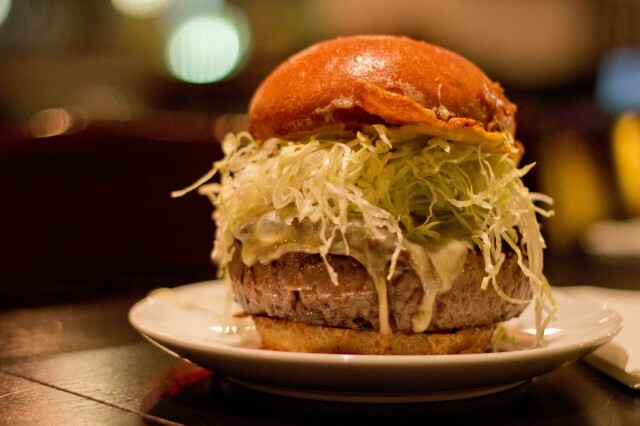 The playground burger is Chef Quinn’s quintessential item at Playground. The patty is the star of this burger. The Kobe beef, more specifically, a wagyu brisket and wagyu tri tip blend are first dry aged in house. 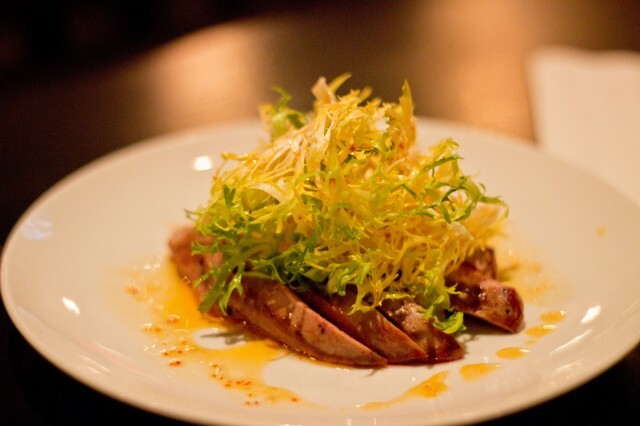 The beef is grinded in a specific way in which the beef strands out into a tourshon. This basically creates a meat cylinder where all the strands of meat go the same way. When cooked, and eaten, the texture and flavor is like no other. It kind of breaks off as you bite into the burger. It is more of a rubbery, jerky like kind of texture and mouth feel. This also made the beef overcooked — no medium rare. I won’t say that it is a pleasant texture, but interesting. The toppings on this burger are perfect though. This burger has a maple bourbon onion compote, shredded iceberg lettuce, scratch made mayo, and scratch made mustard. The cheese selection of gruyere and Fontana was nice, and the horseradish potato bun was perfect. This burger definitely isn’t a typical burger, but the flavors are all intense and work perfectly. It would be interesting to try this exact burger, but with a traditional patty cooked medium rare. From all the burgers and fries, I had to wash it down with something. 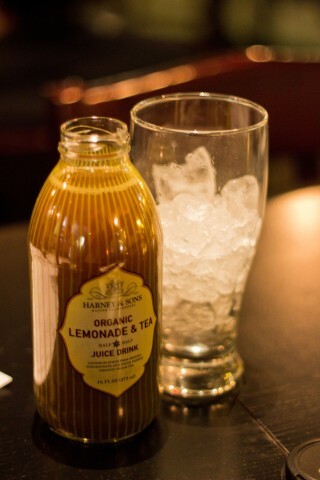 Harney & Sons Lemonade and Tea was the perfect remedy. This bottle of Arnold Palmer was amazing. It might be my favorite bottled tea and lemonade mix of all time! Aside from the burgers and fries, I wanted to see what Chef Quinn had as far as other dishes go. The grilled duck breast was calling my name. A fan of everything duck, namely duck fat, I was excited to have this dish. With perfectly cooked duck breast and a chile vin frisee salad on top, this was a treat. The fatty duck cut with the bitter frisee and sweet yet peppery dressing, the flavors melded perfectly. For dessert, Rum Budino was on deck. Amazing in texture and with the perfect amount of sweetness, this dessert surprised me. 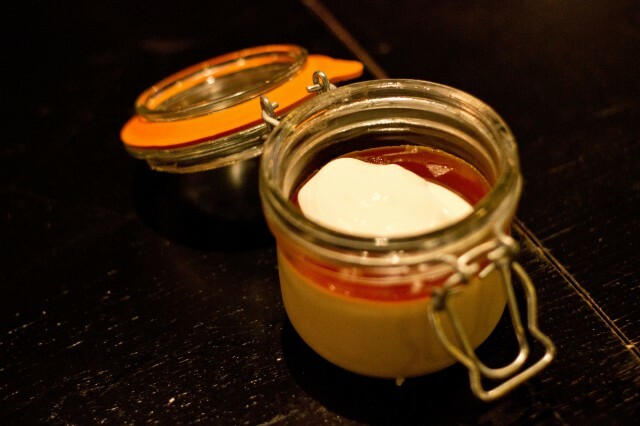 Budino, a custard like pudding was a perfect end to our meal. The velvety smoothness married with the even smoother crème fraiche was utter bliss. With a sweet caramel on top, I was spooning every little morsel. This was indeed a jar of pure joy. The Playground in Downtown Santa Ana is a treat. The menu is fresh and diverse. Jason and his team of professionals have a passion and zeal for good food and service. This is something that is refreshing and new for a restaurant. Often times, restaurant owners along with the chef lose their vision and passion for the food business. It seems that they have their ducks in order and know what they are doing. It is exciting to wait and see what they will have in store for the following years to come.